Peterborough's Carley Stenson Strikes A Deal On "Dragons' Den"
Carley Stenson at SpliceAnother local entrepreneur (there have been many) entered the den on Wednesday night's episode of Dragons' Den to deliver her pitch. Carley Stenson of Peterborough created the company Anywhere But Here, which is a global fashion house that carries unique and authentic clothing from around the world. One of those products are Siams, a one size fits all Thai fisherman's pant perfect for yoga, the cottage, maternity, or simply lounging at home. I discovered these pants myself last summer from her booth at the International Dragon Boat Festival. I knew right away it was a product I would love. Carley was most helpful explaining and demonstrating the product. In order to promote her company, she held an event at Splice on Wednesday night for the community to come to. 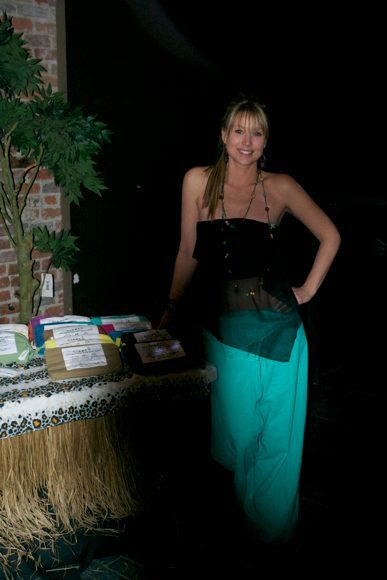 A tropical themed event, she had her products on display for purchase, followed by the screening of Dragons' Den. Her pitch on developing her Thai fisherman's pant further was the first to be presented on the episode and after four of the Dragon judges turned her down, she struck a deal with the fifth judge, Jim Treliving. Congrats to Carley!